McGrath is on a hat-trick, in he runs, the ball hits…something…and it’s caught at slip. The whole of England holds its breath and turns to Billy Bowden. It’s in your hands now. I don’t think there was bat or glove on that…I don’t think…but….and suddenly my head is in my hands. I care not if it was a correct decision, Bowden’s finger is in the air. Pietersen walks away, McGrath has a hat-trick, it’s 67-4. Only down from here. And indeed, despite England having supposed batting depth, Flintoff, Collingwood, Jones and Giles can do very little. Warne and McGrath rip through England like only they know how, 150 all out, Australia have plenty of time to chase down 157, and do it by six wickets. Well played, I guess, England, 2-2 against the Aussies is not to be sniffed at, but there go the Ashes – again. Better luck next year, perhaps? So three years later, my alternative ending may confuse people who are a little more familiar with the fairytale where the South African wins back the Ashes for the English. A dangerous game we all play at some point is virtual history, that is what if? But the weight on England’s shoulders these last three years has been that monumental victory in 2005 and many have said that England have wished to replicate too much of the same thing since. The focus of the English on the Ashes above all else has been a constant criticism both at home and abroad and too many selections have said to have been based around the yearning for those magical days in the fantastic summer that was 2005. Is this fair? Have English selections been unduly influenced by a desire for what was? 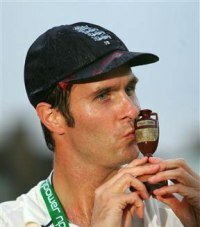 Was the Ashes victory of 05 detrimental to English cricket. What would have happened if the series had ended all square and the Aussies kept hold of the urn? It’s easy to look at things with hindsight, but let’s just make it clear that for me and cricket fans of my nationality and generation, 2005 is as good a summer as is available through the memory banks. It seems like a dream to think about it, the way everything just clicked. The way the team has performed, and its results since, they have been likened to those of the side that won the Rugby World Cup in 2003 and then went into an unimaginable decline. But those comparisons are wrong. The Rugby side reached the top of the mountain, they were world champions and achieved what they set out to do. They deserved the hysteria and their time in the sun. I didn’t think or say it at the time, but the Ashes winners should not have gotten a bus parade and all that jazz. They had beaten the best side in the world at home, but they hadn’t reached number one, they hadn’t conquered the cricket world. Receving an open top bus parade for beating number one at home would be like the football team getting one for winning a World Cup semi-final; great and all, hasn’t happened in a long, long time, but the job’s not done. If the series had ended 2-2, there would have been work left to do, and this would have been acknowledged. Whether things would have been any different we shall never know, but it is worth speculating. The first thing that needs to be said, though, is that it is not completely accurate to say that the Ashes eleven (or twelve, if you include Collingwood) were undroppable. Ian Bell endured a wretched Ashes and was not going to play against Pakistan, then Michael Vaughan did his knee. And in India, Simon Jones was set to return, and they wanted to play two spinners. So who was going to miss out? Matthew Hoggard – he ended up with 7-86 in the match, including six in the first innings, and memorably rode a motorbike around the outfield when awarded man of the match. It seems somewhat ludicrous to think that Hoggard might have missed out to accomodate Ian Blackwell, but that is what was going to happen. It does show, though, that the selectors weren’t totally looking backwards, even if their thinking was obviously flawed, as there is no point playing two spinners if one is useless and the other (Panesar) totally unproven. There is an element of backwards looking in the desired selection anyway, as it should have been obvious to anyone that Harmison, not Hoggard, should have been the man to miss out. Harmison, though, is one of the best examples of backwards thinking that has dogged selection since the Ashes. He did very little of note towards England actually winning the urn, aside from a gorgeous slower ball to Michael Clarke at Edgbaston and constantly performed badly for a long time following the glory. England’s best win post-2005 came without Harmison, at Mumbai. He played one blinder, at Old Trafford versus Pakistan, aside from that was eratic and sprayed the ball everywhere. Had he not been part of the Ashes XI, he would surely have been dropped much sooner as we endured miserable performances littered with wides but were reminded by critics and fans alike that he was “the most destructive bowler in the world.” It took over two years of mediocrity from Harmison for him to lose his place. More on him later. The team that went to Pakistan in late 2005 went there with huge expectation of a second successive victory there, after the glorious win in the dark in 2001. They underperformed, and though in the series at times, went down 2-0, deservedly. One of the most painful memories that follows the Ashes is of the pitiful collapse in Multan, where England failed to chase a target of less than 200. Last day chases are always tough, but there was an element of complacency that we best associate with our celebrity-studded football side. They were not as good as they thought they were, or perhaps thought “we’ve beaten the Aussies, we can beat this lot no problem.” It would almost have been forgiveable had we learnt from that, but we have witnessed the same thing over and over since. Selection between the Pakistan series and the Ashes in Australia wasn’t entirely retrospective, there were some ridiculous choices made by the selection committee, Saj Mahmood and Liam Plunkett are names that spring to mind immediately. Yet you can’t help but think that the basis in their selection was that we had beaten Australia by bowling at 90mph, if those bowlers that did that aren’t available then let’s just pick others that can bowl that fast, results will reflect this. And let’s not forget, Mahmood can get the ball to reverse swing. If the Aussies can’t play reverse swing, noone can! After an average beginning in India, Monty Panesar really enjoyed himself at home in 2006 and quickly became a fan favourite. He was embraced by the cricketing public, and it seemed that Ashley Giles was going to face a long, hard fight to get back in the side. Alas, the amount of times I read articles, blogs, posts saying “the problem with Panesar is that you can’t play him with Flintoff/Hoggard/Harmison/Jones because he can’t bat so the tail is too long.” Yes, this is true, but why is that Panesar’s problem? Why did we have to play the same pace quartet that had defeated the Aussies? The English media and fans wanted as much as possible to remain the same as it had done in summer 2005, as obviously it would result in the same outcome. We had yearned for a half-decent spinner but doubted him because of his incompatability with our over-endorsed pace attack. Of course, we all know what happened down under. There was public outrage here in England, fan favouritism taking over from nostalgia, because Panesar was dropped for Ashley Giles, who had played very little cricket in the previous twelve months. Duncan Fletcher’s desire for batting depth is not to be taken lightly, as we all know the harm a long tail can do to a side. You have to wonder, though, if Giles hadn’t been part of the winning team 15 months earlier, would he have been selected? Or rather, had it finished 2-2, had Giles not played that career best 59, would the same decision have been taken? We’ll never know, but the perhaps more jarring decision was that of dropping Chris Read and replacing him with Geraint Jones, again on the basis of batting. The problem being, Jones had greatly improved his keeping but at great cost to his batting and Read had batted quite well in his two Tests on return. Jones was an Ashes winner, though, so there was only ever going to be one winner. I said earlier that Ashes heroes were not seen to be undroppable, Bell and Jones were both dropped in 2006, and Hoggard nearly was. But we have to look at raw facts, the side that lined up at Brisbane included all available MBEs. Trescothick, Vaughan and Simon Jones were unavailable; Strauss, Bell, Pietersen, Flintoff, Geraint Jones, Giles, Hoggard and Harmison all played. Obviously some had earned their places; Strauss had enjoyed a decent time of it but was denied the captaincy to avoid upsetting two other members of the class of ’05; Flintoff and Harmison. Bell had actually been dropped after a poor return in India but came back with great fruits against a third-rate Pakistan line-up – alas, you can only score runs against the bowlers you face and so you could not question his right to be in the side, nor Pietersen, who has rarely let England down and despite his celebrity status rarely plays like somebody who thinks he is too good to be there. Going into the Ashes without a fit Flintoff would have been madness, but the key word is fit, had the series been in Sri Lanka or New Zealand he would not have played and therein lies the crucial point; the Ashes are approached differently. More will be risked and more will be reminisced after, in spite of the damage it may do to the team when we play the rest of the world. Let us fast forward 15 months or so, to New Zealand early this year. Hoggard and Harmison were sensationally dropped by a new regime that had shown it wasn’t going to be tied down by the fact that players had earned MBEs for winning a series for England. Strauss had also been dropped, but was soon recalled. With the departure of Duncan Fletcher a year earlier, England had departed with the past, and the side became a very different one to that which had won the Ashes. An 80mph bowler (Sidebottom) became the leader of the attack, as it was realised that good bowlers not fast bowlers are the way to go – it just so happened that when Flintoff and Jones had the Aussies on the ropes they were both good and fast. Alastair Cook, James Anderson, Monty Panesar and Stuart Broad all became regulars, and the England side which went a record six games unchanged featured just five of the Ashes team – and that is including Collingwood – and none of them were bowlers. So lesson finally learned, it seems. Except now, you almost feel they have gone too far the other way. Hoggard and Harmison have both been bowling well this season, particularly Hoggard, and yet can’t get near the side, but somebody who has played twelve first-class games (Pattinson) can. It is almost as if the selection committee now wants to say that they can win things their own way and they don’t need this Ashes burden hanging over their heads. Which is great in some ways, but at the end of the day selection should always be based around one thing and one thing only: what is the best available team for this match? It is interesting to ponder how differently things might have been had Pietersen been given out and Australia retained the Ashes. A tied series would certainly have been no disgrace, and would surely have spurred the team onto greater things, instead of settling for false illusions of their own greatness. The five-nil defeat in 06-07 was as low as the 2-1 win 05 was high, it is so tantalising to wonder whether we would have imploded quite so badly if we hadn’t gone their holding the Ashes. Though we must recognise that we were beaten by one of the great sides playing wonderful cricket, we should never have gone down by five. Drawing the series in 2005 would surely have shown us that we had come a long way, were nearly there but further work was needed, hence selection would have been more flexible, more geared towards the future rather than the past. Instead, the players thought they had reached where they needed to be, not realising that a tight win against the Aussies at home is likely to result in a hard time away. The selectors just wanted the same formula, over and over, because it had worked in 2005. The result was that just four Test series have been won since, and none of these against Sri Lanka or India, the two teams out of the top tier that England have faced in that period (aside, of course, from Australia). Whether results would have been any different is highly debateable and will always be fruitless because virtual history is a dangerous game. Alas, we were nowhere near proactive enough and results mirrored those that my generation grew up with, some nice wins mixed with embarassing defeats. We were the second best side in the world with room for improvement, this was never recognised and we floundered.